Yesterday I had an epiphany, realising that English is a very cruel language. It hugs you, smiling, and then stabs you in the back. 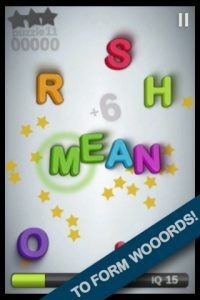 The game that made me realise this was Wooords ($1.99, currently on sale for $0.99): Rearranging nine fridge magnet letters to form words of four letters or more, I noticed with horror that the comforting, homely ‘dad’ is just one vowel away from a rather more brutal word – ‘dead’. My heart began to ache. Thankfully, Wooords proceeded to entertain me from there on in. 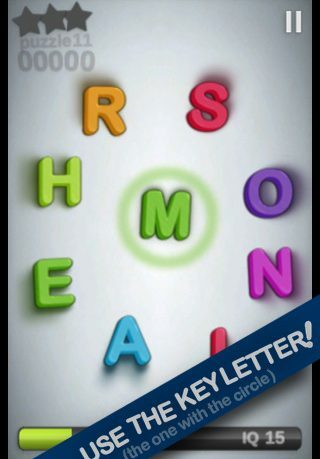 The app tasks you with forming as many words as you can when given a set of letters. The difficulty lies in that one of these letters is circled, and the circled letter must be included in every word that you form. If you can identify words in quick succession, you build a combo multiplier that drastically increases your points total. 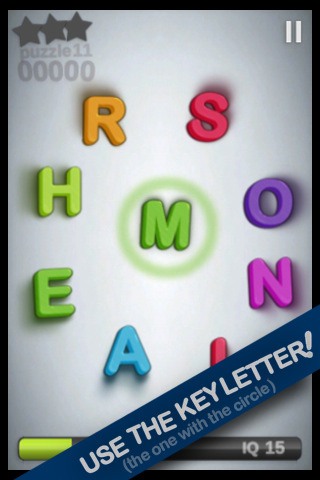 The game has three modes – classic, daily words and word jam. Classic mode consists of 30 levels, where creating enough words in one level unlocks the next. Levels also come with a star rating system – the more words you create, the more stars you earn (up to three per level). It’s fairly easy to unlock each level, but difficulty kicks in if you want to earn all of the game’s stars, sometimes requiring that you collate obscene numbers of words. Another incentive to create as many words as possible is the game’s IQ system. As you earn points, your in-game IQ level (and ego) receives a boost. The second mode, daily words, is a global mental wrestling match with other Wooords players, giving you a different set of letters to play with every day. The person that scores the most points is placed top on the leaderboards. Finally, Word Jam is a rounds-based mode where you need to obtain a certain number of words per round to progress to the next one. Unfortunately, I seem to have a unique bug that means that for me, rounds last very little time and I earn large amounts of points for each word I form, resulting in my topping the global leaderboards. I haven’t got a clue how it happened and I don’t deserve to be there, but I can’t help it. It appears that I’m the only person to have experienced this problem, so it’s probably something to do with me rather than the game, but it does mean that I can’t really say whether Word Jam mode is good or not. From what I’ve seen, it should be the former. Probably the game’s best card is its presentation. Letters are brightly coloured fridge magnets that you can drag to wherever you want on the screen. To create words, you simply pull letters together. The system works very well, is incredibly intuitive, and gave me an odd sense of freedom that the limiting keyboards or playing areas of other word games can’t provide. To further enhance the experience, graphics are spot-on. The circled letter acts almost like a beacon of light. Moving it changes the lighting and shadows of all of the other letters on the board. It’s a subtle effect, but it really adds to the polished feel of the game. Sometimes, play can descend into trial and error. I found that on a few levels, I had to just guess at combinations of letters that might be some abstract scientific word, and thanks to the game’s extensive dictionary this approach was sometimes fruitful. Such a play style is, however, a last resort, and that it exists doesn’t detract from the fun factor of the game itself. Overall, Wooords is a unique word game that ranks amongst the best literary puzzlers in the app store. It’ll keep you entertained for a few hours, making it easily worth the asking price. If you want apps that will tax you and relax you whilst testing your vocabulary, this is worth purchasing.